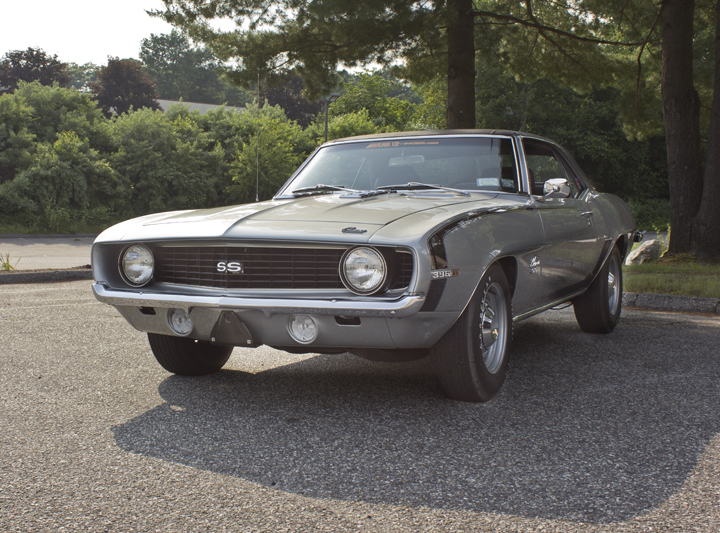 The 1969 Camaro marked the last of the first generations and is arguably the most popular. While it shared the same basic body style as its earlier siblings, it featured entirely new, more aggressive looking sheet metal and an entirely revised grille. The familiar coke bottle shape was flatted more to give the 1969 Camaro a lower and wider looking stance. The grille was much more angled and the parking lamps were moved to the lower front valance below the bumper. Other than the roof itself, the 1969 Camaro doesn’t share very much sheet metal with earlier models. 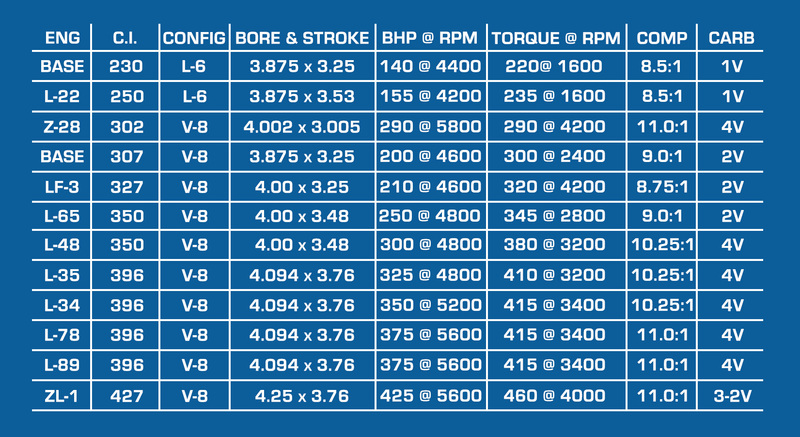 To complement the wide variety of available colors were the available drive train combinations that could be opted for on the 1969 Camaro. Base power was had by one of two available six cylinder engines. Buyers who wanted more power could opt for aV-8. Manual transmissions were either 3 speeds or 4 speeds. The 2 speed Powerglide was the standard transmission and a 3 speed Turbo Hydramatic was optional. Production: 225,512 coupe, 17,573 convertible, 243,085 total. * Seventh digit: is N for Norwood assembly, L for Van Nuys. * Last six digits: increased one with each car built at each plant. Note: L-89 differed from L-78 in having aluminum heads, larger valves, a specific Holley carburetor, different transmission, etc. LF-3 was superseded by 307 V-8 as 1969’s base V-8. Only 50 ZL-1’s, the aluminum-block 427, were installed in Camaro’s by the factory. 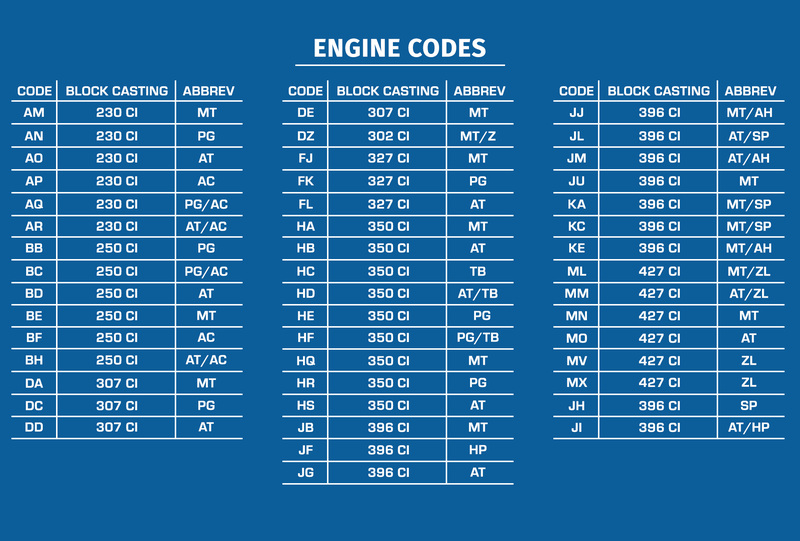 Interior Codes: 711=Bk/S, 712=Bk/C, 713=Bh/C, 714=Yh/C, 715=B/S, 716=B/C, 718=R/S, 719=R/C, 720=0h/C, 721=Mg/S, 722=Mg/C, 723=Dg/S, 725=Dg/C, 727=Ib/S, 729=Ih/C. Abbreviations: B = Blue, Bh = Black Hounds tooth, Bk = Black, C = Custom, Dg = Dark Green, Ib = lvory/Black, Ih = lvory/Hounds tooth, Mg = Medium Green, Oh = Orange/Hounds tooth, R = Red, S = Standard, W = White, Yh = Yellow/Hounds tooth.